The birthplace of the Renaissance and the capital city of the Italian region of Tuscany, Florence is a stunning and utterly irresistible center of medieval European trade and finance. It is one of the wealthiest cities of that era and known as “the Athens of the Middle Ages”. The Historic Center of Florence was declared a UNESCO World Heritage Site in 1982. It possesses a treasure of medieval chapels, palaces, world-class art museums and galleries, such as the Uffizi Gallery and the Palazzo Pitti, wonderful churches, and astonishing monuments and architecture. Italy is famous for its fashion and Florence is ranked in the top 15 fashion capitals of the world, because the fashion industry was born and bred here. Back in the 1920’s, homegrown designers Guccio Gucci and Salvatore Ferragamo opened the first haute-couture boutiques. Surrounded by wine-rich hills, Florence is a traditional gourmet paradise where ribollita, a tripe panino or a blue T-bone steak and homemade wine are the symbols and trademarks of the ancient city. Starting from central Rome this enjoyable journey will take you on a full-day tour to the “Cradle of the Renaissance”, marvelous Florence. Passing by the green valley of the Tiber River to the slopes of the Apennines, you will first arrive to the medieval city of Pisa. A beautiful day to see the historical and unique monuments of the city such as Piazza Miracoli, the ancient Baptistery and the Duomo. Once you are here you will have a chance to see one of the Seven Wonders of the medieval World, the pristine Leaning Tower with its distinctiveness. The journey continues to the shining city of Florence, the birthplace of Italian fashion and the symbol of traditional Italian cuisine. Florence offers you awe-inspiring masterpieces. The Accademia Gallery where Michelangelo’s David sculpture is situated and the Renaissance art by Leonardo da Vinci and Botticelli. Don’t forget to see the impeccable Cathedral of Santa Maria del Fiore, the Baptistery and the Giotto’s Bell Tower. The calming beauty of the river Arno and the panoramic view from the “Piazzale Michelangelo” are also a great reason to visit this ancient city. In the late afternoon, take a minivan to return back to Rome. Amazing walking tour from Rome to Florence, the birthplace of the Renaissance. Once you arrive you will enjoy a full-day round-trip and pay a visit to the highlights of the city. This city offers a bequest of art and architecture. Walk through the cobbled medieval streets and see the enchanting masterpieces by Botticelli, Michelangelo and Leonardo Da Vinci, situated at the “Accademia”. There you will enjoy the marvelous work of Michelangelo, the statue of David. On this tour you will admire the Cathedral of Santa Maria del Fiore, the Baptistery and Giotto’s Bell Tower. Florence is well-known for its steak with good red wine, so afterwards you can enjoy a great lunch on your own charge in some of the restaurants or pizzerias. At the end of the tour, you can also visit some of the boutiques and relish the perfect fashion that Florence offers, being one of the 15 fashion capitals of the world. Travelling from Rome, crossing the green Tiber Valley, passing by the slopes of the Apennines and admiring the olive groves and enchanting landscapes of vineyard hills of Tuscany is what makes this journey truly magical. When you arrive in the capital of Tuscany your first stop will be the historical riches of the Accademia Gallery. Inside the gallery you will discover the unique works of Michelangelo, the statue of David, the masterpiece of Botticelli, “Madonna and Child”, and the unfinished sculpture also by Michelangelo, Quattro Prigioni. Continue the tour through the narrow cobbled streets of Florence and admire the original designs of the Renaissance, the Giotto’s Bell Tower, Florence Duomo and the Basilica di Santa Croce, the burial place of Michelangelo. Florence is also well-known for the leather-making schools, so this is your chance to learn something more about it, and also enjoy historical crafts like goldwork and mosaics. The trip will finish in the afternoon when you will have a chance to have lunch in a typical Italian restaurant near the Piazza della Signorina and then take a coach ride to return to Rome. 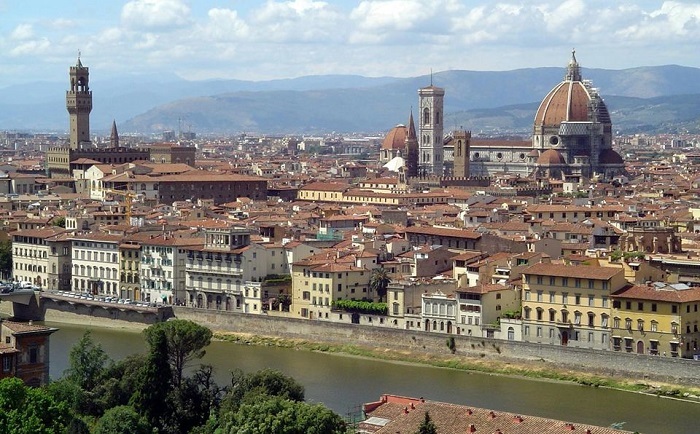 Visit the northern province of Tuscany on a full-day tour to the Renaissance city of Florence. Crossing the green valley of the Tiber River to the slopes of the Apennines, you will enjoy the vineyards of the Chianti wine region. 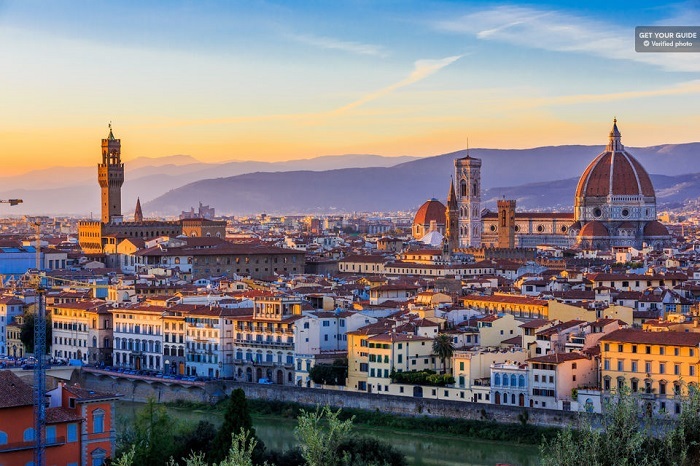 Florence is the most beautiful city in Tuscany, so once you are here you will discover the magnificent historical landmarks such as Ponte Vecchio, the Duomo cathedral, the Baptistery and Giotto’s Bell Tower. Visit the world-renowned Accademia Galleria and delight in the magnum opus by Michelangelo, Botticelli and Leonardo da Vinci. Furthermore, taste the delicious pizza or traditional Italian lunch in some of the local restaurants. Afterwards, you will get aboard the minivan to journey back to the capital of Italy. Take a high-speed train from Rome and enjoy the landscapes of the Italian countryside rich with olive groves and unique vineyards. Once you arrive in the splendid city visit the famous tourist attractions such as Via dei Cerretani, Piazza della Repubblica, Piazza della Signoria and Ponte Vecchio. Your guide will give you an educational tour of the historical masterworks and tell you more about the original Florentine history. This tour offers you skip-the-line tickets to the Uffizi Gallery where you will learn about the respectable artists from the Middle Ages, including Da Vinci’s work, “Annunciation”. Later, you can spend your free time enjoying the lovely sights in Piazzale Michelangelo and the Boboli Gardens. The tour will finish with a visit to the Cathedral of Santa Maria del Fiori and the Accademia Gallery. This old gallery is one of the main things that you must see when you are in Florence. Built in the 16-th century and designed by Italian painter Giorgio Vasari, this structure is architecturally fascinating. The gallery houses Renaissance masterpieces by world-famous artists such as Michelangelo and Leonardo da Vinci. Here you can also see the finest work of Boticcelli, “Birth of Venus". If you desire a most spectacular view of the city then you should probably visit the most glorious square in Florence, Piazzale Michelangelo. 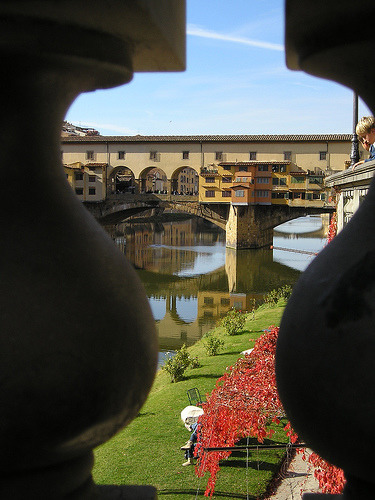 Situated across the river in the Oltrarno district you can see the Palazzo Vecchio, the Duomo and the Uffizi Gallery. The world-famous Accademia brings the best works of art by renowned painting masters. You can see the grandiose works by Michelangelo, the famous sculpture of “David”, that stands 17 feet tall, the best work by Botticelli, “Madonna and child”, the unique works by Leonardo Da Vinci and many other historic works. The famous Duomo with its 463 steps gives a magnificent view of the whole city. It was the largest building in the world until 1881 and it’s the highest point in central Florence. If you like to discover classical artworks, then you should probably know that just next door is the Opera Duomo Museum. Built at the narrowest point of the river Arno, Ponte Vecchio is an important landmark and the most famous bridge in the city. 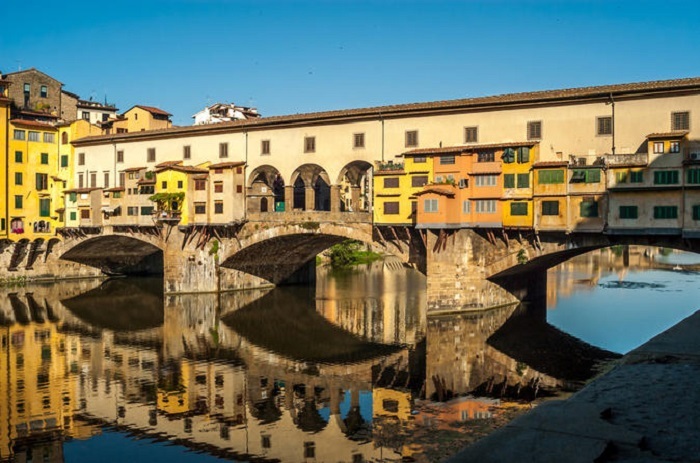 This bridge was built by Vasari for Duke Cosimo I de‘Medici in 1565 and it’s the main route that connects Palazzo Vechio with Pitti Palace. Do you like to taste the best Italian cuisine or maybe purchase the best fashion pieces? Well, this is the right place where you will find both. 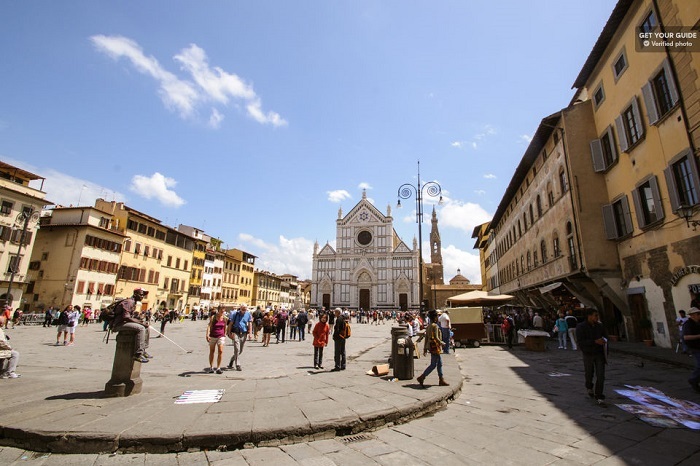 Centered on the church where Machiavelli, Michelangelo and Galileo were buried, Santa Croce has the best restaurants, exquisite fashion stores and vibrant nightlife. A home of the best markets, bars and restaurants, Piazza San Spirito will give you a taste of the cosmopolitan city life. Here you will find some of the cheapest restaurants in town. Just cross the river and you are at the right place where you can enjoy the peacefulness of the churches, or sit on the steps and watch the people walking. One of the greatest open-air museums in Florence well-known as the example of “green architecture”, Boboli Gardens, inspired many European Royal gardens. They are decorated with sculptures, old oak trees, fountains and offer peaceful shelter from the sun in summer. In spring you can smell the blooming flowers and in autumn you can enjoy the beautiful colors of the changing foliage. You are in a mood for shopping or you like to spend some cash? Then this is the place for you. The San Lorenzo Market, known as Mercato Centrale, is the best place where you can spend the day buying some local ingredients or maybe a souvenir to bring home. The market is separated in two parts and in the hundreds of stalls you can find pottery, notebooks, souvenirs, clothing and different leather goods such as wallets, belts, jackets, or bags. Try the local delicacy and enjoy the best abomasum sandwich called “panino con lampredotto”. You can find lampredotto stalls near every important square in the city. But if you want pizza then taste the traditional Neapolitan pizza, famous “mozzarella di bufala” that is still prepared in the traditional way, as it is still made in Southern Italy today.